A rash of car thefts appear to be connected to a particular radio station and a puzzling code. Pete becomes friends with the car thief while Julie and Linc check out the station. Most beautiful actress represented by Ford Models? An anthology comedy series featuring a line up of different celebrity guest stars appearing in anywhere from one, two, three, and four short stories or vignettes within an hour about versions of love and romance. The crew of Los Angeles County Fire Department Station 51, particularly the paramedic team, and Rampart Hospital respond to emergencies in their operating area. * It's very much of its' late 1960s time with the counter-culture and all. But it's amazing to me that three full-time undercover cops have so much time to not do, well, cop things. They seem to start their own cases all the time instead of being assigned what you'd expect undercover cops to do... long-time stake outs of drug dens and such. They're being paid for something but they're always just living a teenage life and crime just happens to show up while they're doing it. * The fact that Julie apparently can't do anything to defend anyone except running for Linc and Pete just grates my nerves. She sees trouble, she screams, and she runs for help. 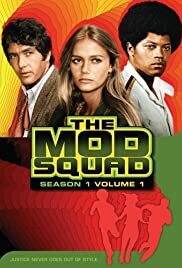 There were some strong women in the 1960s -- nobody messed with Kitty on "Gunsmoke" -- but "Mod Squad" isn't there. It would be a decade before a show like "Cagney and Lacey" hit the airwaves but it was desperately needed.